Unveiled in 1972, the Royal Oak designed by Gérald Genta has achieved mythical status by defying the tastes of the era to become a hallmark of Audemars Piguet. Utterly captivating and endlessly adaptable, the world's first luxury steel sports watch holds a distinctly modern appeal, from time-only models to the most sophisticated complications. The octagonal bezel, the textured dial, and integrated bracelet define their disruptive history through enduring excellence and mechanical mastery. This iconic Royal Oak “Jumbo” Extra-thin model gets a dazzling new look in 18-carat white gold, entirely set with brilliant-cut diamonds. Selfwinding watch with date display. 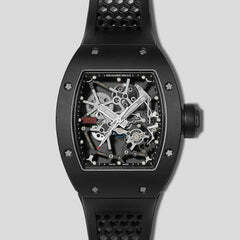 39 MM 18-Carat white gold case, Royal Oak hands with luminescent coating. Water resistant to 50 meters. 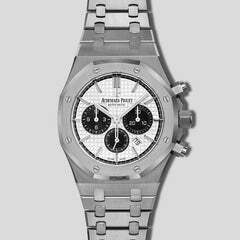 Material Good is an authorized Audemars Piguet dealer, our new watches are guaranteed with a full factory warranty.